Notes: Volume 9, Number 7. 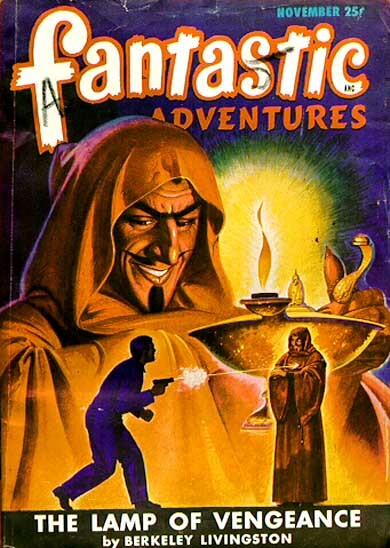 The cover illustrates "The Lamp of Vengeance". "The Editor's Notebook" is initialled W.L.H. by Associate Editor Hamling. Artists credited in table of contents. The signatures (last name only) for Enoch Sharp and Henry Sharp appear to be identical. Alexander Blade and James B. Settles are credited as the authors of "Son of the Sun" in the table of contents. Blade alone is credited on the title page of the story so Settles is presumed to be responsible for the back cover illustration.